You are possessor of all knowledge, full of virtue and wisdom. You are always prompt and eager to act in the service of Lord Rama. One would initially think that this verse is simply repeating praises of Hanuman that have already been stated. After all, the Hanuman Chalisa has already praised Hanuman’s knowledge and his devotion to Lord Rama. But when analysed in the wider context of the Ramayana, this verse contains a formula that allows us to overcome the obstacles that we come across in life. The verses of the Hanuman Chalisa often allude to portions of the Ramayana. This verse relates to Hanuman’s presence of mind that he displayed when taking the leap across the ocean to Lanka to find Sita. Presence of mind is being able to keep one’s attention on the task at hand, and to act and react with agility of mind to overcome obstacles that come in one’s way. In life, most of us set well meaning goals in our moments of enthusiasm but very few people actually succeed in accomplishing the goals we set. This is because life throws a number of obstacles upon us which eventually thwart our best intentions. Hanuman’s example shows how to overcome all obstacles. As Hanuman leapt across the ocean to Lanka in search of Sita, he encountered three great obstacles. For many people who are engaged in an important task, our tendency to rest inappropriately before the task is completed is a major weakness. Furthermore, when we are honoured and treated politely, as Hanuman was in this incident, most people would be coaxed to take time out from our task for pleasure. Yet Hanuman, whilst maintaining courtesy, turns down such an offer to stay focused on the task. Later, Hanuman is confronted by a creature named Sursa – the mother of snakes. She wanted to devour Hanuman for her food. Hanuman told her that at the moment he is engaged in a very important task, and that she should let him complete it. He explained to her Sita’s plight, expecting Sursa to understand and let him go, but to no avail. He then tells her that if she wants to eat him, she should just get on with it and stop talking. Upon saying this, Hanuman made his body huge. Sursa responded by making her mouth larger and larger. Hanuman continued to make his body larger, while Sursa made her mouth equally large. All of a sudden, Hanuman made himself very small, and entered her mouth and came out before she could close it. He said “Mother, I entered your mouth and you didn’t eat me. Now please can I go?” Sursa smiled and praised his cleverness, calling him “Chatur”. Sursa represents obstacles and conflicts that we may encounter in our path to accomplishing our goals, which are unrelated to our main mission, yet can take up a lot of our time and energy and cause distraction, delay and failure. Hanuman did not get caught up in fighting Sursa, but found a way to side-step her challenge. He foregoes considerations of his ego and pride, made himself small, and got out of the situation. In my own life, I continuously encounter adversity which distracts me from doing what I set out to do. For example, while researching material on the internet for my articles, I often come across message boards on which someone makes a disparaging comment about Hinduism. My tendency initially was to go on the message board and start arguing and debating with the person. This in itself is worthwhile, but in these circumstances my arguments and debates actually prevent me from completing articles on time. And in actual fact many more people read these articles compared with the number of people who view the message board arguments. Hanuman’s example is not to get caught up in side battles and to stick to the task you set out to do. The third great obstacle of Hanuman during his journey to Lanka was the demoness Simhika. She was a sister of Ravana and dwelt in the sea, controlling access to Lanka. 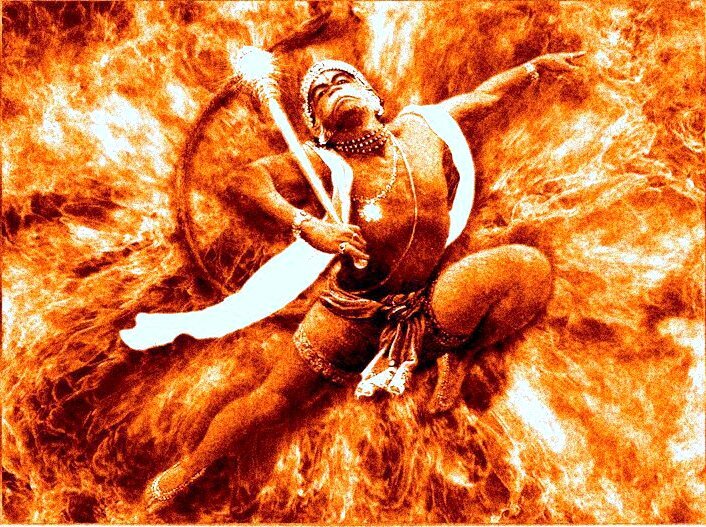 As Hanuman was passing through the sky he felt a force pulling him down. He was dragged into the ocean and saw Simhika. Here Hanuman took a very different approach to overcoming this obstacle. He instantly slew her. The reason why he slew Simhika but not Sursa is that there was no way he could have passed Simhika without fighting her. Therefore to achieve what he set out to do, Hanuman had to remove her from his path – which he did rapidly and effectively. Generally, obstacles and enmity that can be avoided should be avoided, rather than for us to get caught up in dealing with them. However when encountering an obstacle or situation that must be dealt with, which leaving unresolved will thwart our progress, such obstacles should be dealt with effectively and forthrightly, using whatever means necessary. On an internal level, Simhika is said to represent jealousy. Jealousy is quality that should not be entertained or tolerated in our hearts even for a second. It drags us down and ruins us and others. Men and women who are striving to achieve noble goals should guard against the entrance of jealousy into their hearts, and should equally try not to show off or act in a way that can invoke jealousy in others. Jealousy is a perversion of admiration. Admiration tends to lifts up the individual to the level of that which he/she admires, but jealousy drags everyone down. If we recognize jealousy in ourselves we should slay it with the same speed and efficiency that Hanuman slew Simhika. Being “Guni” is to have a character of such quality and caliber than won’t tolerate bad qualities in oneself. 1) AVOIDING OUR MOUNTAINS OF REST – When in the process of accomplishing the goal, avoid unnecessary rest and comforts, including offers that come from people who treat us with honour. Respectfully turn such offers down like Hanuman, otherwise face inertia, delay and mediocrity. 2) SIDE STEPPING OUR SURSAS – Avoid “side battles” that distract us and dissipate our energies away from our goal. Particularly issues of pride and prestige that have nothing to do with the task at hand. 3) DEALING WITH SIMHIKAS WE ENCOUNTER – If an obstacle or adversary is encountered which cannot be left alone or side stepped and is directly blocking us from progress, deal with it fast and efficiently. To many, this part of the Ramayana is the most likely to be fictitious and unbelievable as literal truth. Yet the reason why the Ramayana is so revered is because its mystical parables present us with astounding layers of meaning that can be grasped by the subconscious mind. Clearly, there are parts of this story which may not describe physical reality. Yet they often describe timeless teachings and truths through their symbolism. Hindu stories are complementary to Hindu philosophy, and contain several layers of meanings. Pictures, imagery and stories can often deliver meanings and messages in a way that standard philosophical discourse cannot. Imagery has greater evocative power. ‘A picture is worth a thousand words’, the ancient proverb says, and this may not be so far of the mark. You are always keenly interested in listening to the glorious story of Lord Rama. In your heart, Rama, Lakshmana and Sita are well-established. The qualities of Hanuman described in the explanation accompanying the previous verse are very powerful. The question naturally arises; how does one imbibe such dynamism? In Hindu thought, one of the most important ways of developing powerful virtues is to keep the company of the great. This does not just mean physical company, but the company of their thoughts, their lives and their qualities. We develop confidence and inspiration from listening to the virtues of great personalities. This is how Hanuman stays constantly inspired; by ever dwelling on the glorious acts of Shri Rama. The word “Rasia” has no direct translation in English. Implied is the word “Rasia” is a sense of having distilled the essence and taking great joy in it. Hence the verse indicates that Hanuman not only listens to the story of Rama but has also understood its very essence and message. When most people listen to the Ramayana and Mahabharata they engage in a cursory reading, understanding only its surface. Only when the stories are contemplated, discussed and studied with reverence can the essence be extracted, and the true power enter into our lives. The Ramayana gives many timeless teachings to humanity. One of these is to enable one to maintain dignity, calm, poise and principles in all circumstances in life. Look at the highs and lows in the lives of Rama, Sita and the other great characters. They experienced fortunate circumstances beyond most people’s imagination alternated with adversity and cruel fortune. Yet the characters maintained their principles, composure and inner peace, and didn’t get carried away in success or sorrow. Our hearts are often dark like prison houses, which light cannot penetrate into. How can the Divine enter our hearts? The Divine enters only through the windows never threw the doors. He enters through the ears, by listening to the great, noble and beautiful. The Lord enters through the ears of the one who is constantly engaged in hearing the qualities of the Divine. Therefore, being one who is always interested in listening to the Ramayana, Hanuman has the Divine established in his own heart. We can do the same. « What is the best way to ensure Hindu survival: Nationalism or Universalism?